A few days ago I posted about raising an army for Lion Rampant from two boxes of Fireforge 28mm plastic models. I thought I’d do the same again, this time shifting forward a couple of centuries by using 28mm plastic models from Perry Miniatures. Two boxes of their models – which will set you back somewhere in the region of £40 – gives you more than enough models to make a Later English force from: in Lion Rampant terms, this covers the Hundred Years War and the Wars of the Roses (for which the Perry models are designed). The Mounted Men-at-Arms could be replaced with a unit of 6 Foot Men-at-Arms, which Perry Miniatures should be releasing fairly soon. Overall that’s 43 models, which isn't too many to paint. The Later English are one of the smaller armies in Lion Rampant, making them a little fragile for morale but packing a pretty heavy punch. 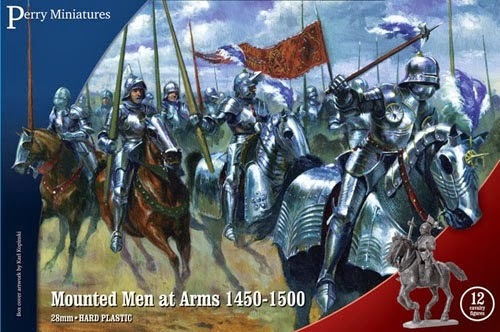 There are plenty of other variations to add from the other boxes of plastic models from the Perry Miniatures range, especially if you’re building European armies without the significant longbow presence of the English. By the way, if you’re wondering why I’ve stuck to plastic models rather than metal ones, there’s just too much choice in metal and the boxes of plastics seem fairly easily available from all sorts of sources. As it happens, most of my own models are 28mm metal Crusader and Curtey’s, and very good they are too! +strongsword+ 1066 10mm 15mm 20mm 28mm 6mm after action report Albert Ball and breathe out Armies of Medieval Burma Armoured Storm Arrow Storm Arthur King of the Britons Arthur's art Arthurian minis artists Battle Ravens BLAM! BLAM! ARGH! Boardgamegeek book news Border Reivers buy me castles colonial minis competition Desert War DR Warband dragon rampant Dux Bellorum Dux Blogorum fantasy minis forums Gameplay example Ganesha Games get involved Glutter of Ravens history and that Imperial Rome interview Legendary Warriors Lewis Chessmen lion rampant medieval minis Most Played Games Myths and Legends: King Arthur Myths and Legends: Round Table Old West Osprey Osprey Adventures PSC Games questions rebels & patriots reviews SAM vignette sci fi Scottorum Malleus Song of Arthur and Merlin Song of Blades and Heroes Song of Rooks and Pawns tanks The Men Who Would Be Kings The Pikeman's Lament True 25mm Un-PC Gaming video Word Mountain Creative Content WW1 aircraft Zulu! All content copyright D S Mersey, date as posted. Simple theme. Powered by Blogger.